Ireland flanker Rhys Ruddock says Wales should expect "a few banged and bruised bodies" during their World Cup opener against Uruguay on Sunday. 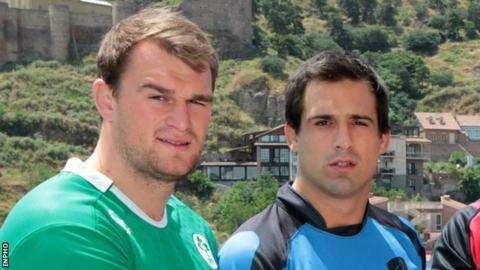 He predicts a "physical" and "fired up" performance from Los Teros, who he faced for Emerging Ireland in June. But the son of Wales' 2005 Grand Slam coach Mike says Uruguay will struggle to "cope" with Warren Gatland's side. "They wouldn't be used to playing at the intensity Wales would be," said five-times capped Ruddock. The Leinster flanker broke an arm for the second time this year as he led Ireland's development team to a 33-7 win over the South Americans in Tblisi, ruling him out of contention for the World Cup. "They're definitely improved, but I do think... they shouldn't really have as much quality to deal with the threats Wales have," said Ruddock. "They're a physical bunch and although they're not probably the biggest team in stature, they play with a lot of heart and desire. "I think they'll be really fired up for it and put in a big performance." Ruddock says Uruguay's main attribute - chop tackling - can also lead to disciplinary problems. "They are brilliant low tacklers," said Ruddock. "I think it's more in terms of their mindset - they look to really chop low around the ankles and sometimes they can be done for ill-discipline with not wrapping [their arms around opponents]. "But in terms of their ability to stop players at the gain-line they are definitely good. "However, if you're able to hold on to the ball and weather the storm for a couple of phases, they tend to not be as well organised as some of the top teams." Ruddock says fitness is also likely to be an issue for a team of amateurs against Wales' professionals. "If you hold on to the ball and bring them through phases and play with intensity and accuracy... they can be broken down quite easily from four or five phases onwards." He added: "I'm sure it will be a physical encounter and you'd have a few banged and bruised bodies." However, Ruddock says his own injury - a second arm break, but not in the same place as the first - had little to do with Uruguayan muscle. "They were physical, but I don't think it had any influence because it was actually the outside-half [Alejo Duran] who landed on me and I don't think he would have been their most physical player. "It was just a bit of misfortune, kind of an awkward fall as opposed to the influence of the Uruguayans." Ruddock is set to return for Leinster during the World Cup, giving him a chance of a call-up if injuries strike Joe Schmidt's squad. "I'm almost back playing myself and I'm hoping to be back on the field for the next Pro12 game," he said. "If that's the case, I'll be fully fit as the World Cup continues."